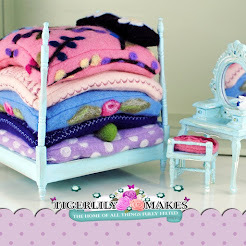 Hello and welcome to the latest segment of the Tigerlily Makes blog. Here at Tigerlily Towers we are always busy preparing for our shows, retailers or our courses. So today's blog is a video blog to talk about just two of our popular courses, what you can expect and the type of projects you could be making very soon on one of one day felt making days. But for now keeeeeeeeeeeeeeeeep felting!